Just a last picture of Cebu taken inside the van taking Tutubi to Mactan Cebu International Airport while about to cross the amazing cable-stayed bridge named after a prominent politician. 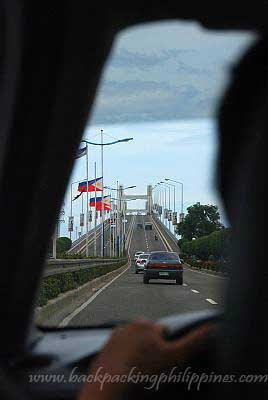 Marcelo Fernan Bridge is one of the two bridges crossing Mactan Channel separating Cebu Island from Mactan Island; the other is the older Mactan-Mandaue bridge. Note that the dark clouds on the horizon were brought by typhoon Frank which was battering Manila at the time Tutubi was about to return there. It'sa good thing his return flight via Philippine Airlines was not canceled when all morning flights of Cebu Pacific Airlines and those of other carriers like Seair and Asian Spirit, using smaller planes were canceled. Tutubi will be back in Cebu, that's for sure! Great shot! Though I have never been to this particular bridge, looks recent. wow! when the bridge was still new, we crossed it by walking from one end to the other. masarap balik-balikan talaga ang cebu, it's one of my fave places dito sa pinas. naalala ko dumaan din kami dito sa bridge na ito sakay ng taxi, sobrang hina nung makina kaya ang bagal-bagal naming umakyat. tapos paglampas na sa bridge nag overheat na yung taxi kaya kelangan namin lumipat. hehehe. be back soon, Cebu has much in store for everyone. try out new places like Paseo, The Walk, Parkmall, hopefully by then Ayala's new wing will be open too. Great car shot of the rise of the bridge. I like to stay in Cebu. We only stayed there for 2 months with my husband and I really enjoyed in Kawasan falls. Its a paradise place, the water is so clear and cold..The people there are very accommodating. http://www.cebu-directory.net/ to see the location of Kawasan if ever you will visit. know the bridge well normally not a fond memory as it often means i am heading to the UK for work leaving my wife April behind in Cebu with the kids. nostalgic, never dreamed there would be a bridge connecting Mactan with Cebu. I was station in mactan air base from 1968 to 1969. drank a lot of san miguel and tanduay. we traveled to Cebu by boat, it was an adventure to catch a boat ride from mandaue to Mactan after midnight in a rain storm. filipino people old and young were great to me, had a wonderful time, I will never forget them. thank you all filipinos in Mactan and Cebu for the great memories.